Real Madrid Castilla forward Dani Gomez signed a new contract in July that will keep him at the club until 2022. 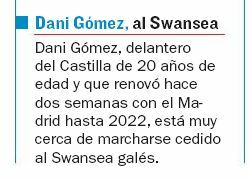 According to Spanish newspaper AS, the 20-year-old will be allowed to go out on a temporary move and the Spaniard is ‘very close’ to signing for Swansea City on a loan deal. 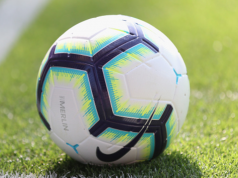 The transfer window in England has closed, but the clubs from the second division and lower can sign players on loan deals until the end of this month. The Alcorcón-born player scored 32 goals at Juvenil A level during the 2016/17 season and was promoted to the Castilla last campaign. He started the last season on a brighter note, which included seven goals in five UEFA Youth League games. Earlier in January, Marca reported the attacker’s decision to not renew with the Spanish capital club saw his playing time reduce, despite impressing with his goalscoring abilities for Real Madrid Castilla. Gomez has now put pen to paper and if AS are to be believed, he will spend the next season on loan at Swansea City.